With Solo: A Star Wars Story newly released in theaters, I had to do another round of food art inspired by Han Solo! This time around, I did some breakfast food art, inspired by the Han Solo Funko Dorbz! Place all the pancake ingredients in a mixing bowl, and whisk together. Heat coconut oil on a pan until melted on low heat, then add pancake batter to make two pancakes. Cook pancakes so lightly colored on each side. 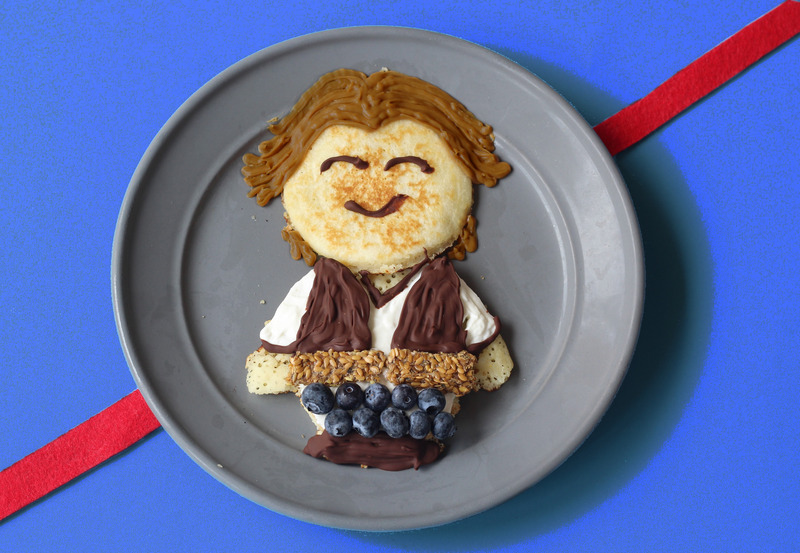 Use a circle cookie cutter to make the top of the Han Solo pancake. Use a knife to cut the rest of the shape of Han’s body. Use a piping bag to pipe Greek yogurt on Han’s body (to cover the shirt and pants, since we will place blueberries and cocoa nibs on top. Use a piping bag to pipe melted cocoa nibs for the vest and shoes. Place blueberries for Han’s pants. Place almond butter in a piping bag and pipe for his hair. Break off a couple pieces of a sesame seed cracker or granola bar for his belt. And there you have it! A delicious, healthy, Han Solo food art breakfast!